There's always something happening in nail world, and right now it's texture. The "hot" look for summer is "beachy" statement nails, in which "beachy" means grainy and jacked-up looking. Sephora is pushing a manicure that uses crushed shells, so it looks like your hands were churned up and wiped out by an aggressive wave. "Textured" reads as grit and dirt: Pretty much the opposite of what a manicure is supposed to be. It's called polish for a reason! It should look polished. Over at XOVain, there are instructions for a "textured, abstract" manicure that supposedly evokes "beachy" memories. That is not beachy. That is Corpse Bride. These nails are about to offer you a poison apple. One reader commented: "I don't want to be mean […] but come on, this is a hot mess." 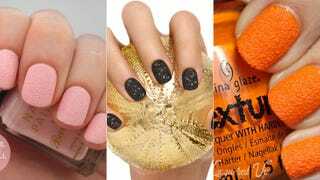 Pinterest is chock-full of hideous, ill-conceived textured nails that look guaranteed to snag your best lingerie in a best case scenario or scratch your cornea in a worst case. Oh, I'm part of the problem: I got a "caviar" manicure the other day and I regretted it almost immediately. It's Belugaria, by Essie, it it should be interesting, weird and glam. Instead it looks like I'm part sea-urchin and I clawed my way up from the ocean floor through Davy Jones' locker. You know the folks in Pirates of the Caribbean with tentacles and barnacles? That's me right now. And this manicure is NOT aging well. Less than a week has passed. My nails look as though they've been engulfed by a fungus and are in the final stages of decomposition. In a word: HIDEOUS. This does not look like caviar. This looks like the filthy crud you use industrial cleaner on so that your bathroom grout doesn't look an incubator for infectious diseases. Anyway, this textured nail thing has been happening for a few years, at least, and it's time for it to die a sudden, violent death. Let us bid it farewell. And if anyone has some cotton balls and polish remover, I'd love to say my goodbyes ASAP. Images via Pinterest/All Lacquered Up, One Nail To Rule Them All, XOVain, my iPhone.